This past weekend I went to my five year college reunion. I know this is super cliche but I really can't believe it's been five years since I graduated college. It feels like no time has passed, yet everything has changed. Such a weird feeling. It was so great to be back on campus spending time with people who I haven't seen in a couple years, and just taking in the beautiful surroundings. One of the reasons why I chose Connecticut College was because of the stunning campus up on a hill with big stone buildings that overlooked Long Island Sound but going back this past weekend made me realize just how beautiful it actually is with the sprawling green and majestic trees. Aside from seeing friends and reliving hilarious memories, one of the highlights was when a campus security officer unlocked the campus greenhouse for me and let me go inside. It was a nice moment of solitude and I really got to take in all of the experiences I had in college, and how this place shaped my life for the better. Perhaps not everyone else has such fond college memories, but those moments four years ago were very special for me and it was nice to be able to appreciate it and look back on everything. Lately I've been trying to do my best at cooking with fresh, seasonal ingredients. When I saw ramps and fava beans at the farmer's market a couple weeks ago I immediately snatched some up with the intent of making toasts with them. Sadly, I am not sure if they are still available at the farmer's markets, but this can easily be replicated with regular pesto and any other spring peas! How love how vibrant these came out and the crispness of all of the greens. The point of toast is that it's easy! Spread ricotta on toast, drizzle with ramp pesto. 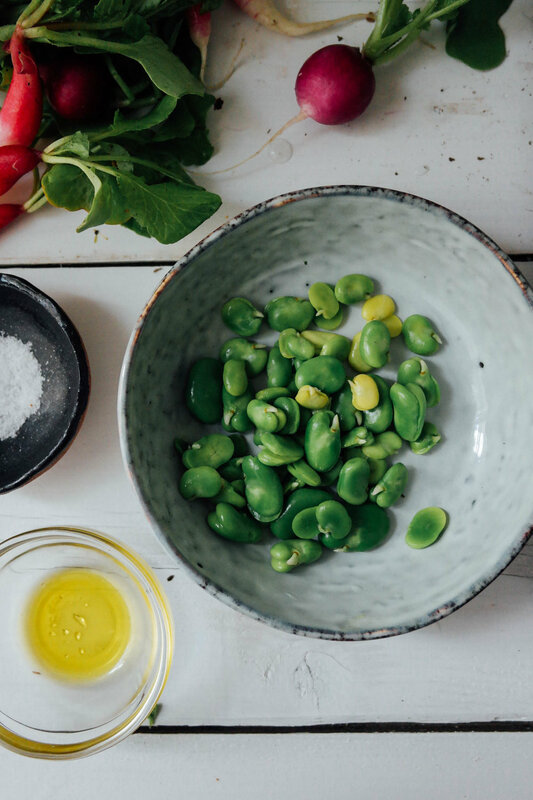 Layer on fava beans and radishes. Top with sea salt and olive oil! In a high speed blender or food processor, blend together ramps, olive oil, spices, and pistachios until smooth. The best thing about this recipe is that ramps are already garlicky so you don't need to add any garlic!